Dad was the celebrated cinema actor Henry Fonda. Her brother Peter Fonda was also a well-known cinema actor, along with her niece Bridget Fonda. 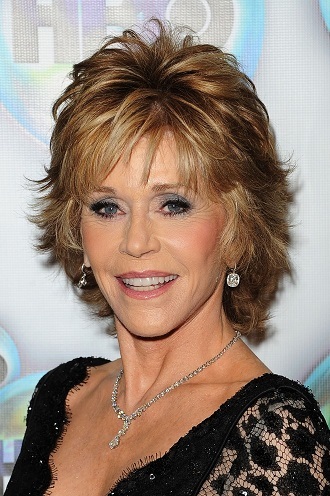 Notorious Mula-Surya mahadasha + Budha bhukti creates a lasting animosity via "Hanoi Jane"
Ms. Fonda = an abundant producer of popular autobiographies. She has enjoyed a 50-year active career in scripted (3) cinema drama, which never ceased even into her late 70's. In mid-life, she developed an extraordinarily successful business producing women's exercise videos. Ms. Fonda reports that for many years of her life, she was unable to imagine herself as being anything more than a physical-material representation = Chandra-1 mutual drishti with Mangala-7 athletic body-focused identity. After the severe childhood trauma of her mother's suicide, some coping mechanisms were crucial to her continued physical survival as a young student and aspiring actress. As dysfunctional as it may have been, Bulimia enabled the young woman to stay grounded on Earth by purging the toxic criticism of nichha-Guru. 6th-from-Chandra often indicates Chandra-related health conditions = often due to psychic exhaustion from overwork in emotional servitude. The core issue is materialism as a sacred doctrine, which is the typical dysfunction of nichha-Guru. Ms. Fonda is a highly successful writer and publisher of books and video training materials. She writes autobiographies which tell truths often considered impolite or inappropriate yet these publications are popular and remunerative. Beginning of the unceasing criticism and tension of her argumentative antiwar narrative. This issues continued long, long after the war was finished, and Ms. Fonda became a national target of reactionary hate. According to Ms. Fonda's biography, while amidst a divorce and still suffering from bulimia , she was intending to promote a message of social responsibility (Shani). Chandra in Magha gets involved in politics but due to dissociative Ketu, Chandra in Magha does not fully understand politics. Photographed sitting astride an enemy cannon (Mangala) and consorting with enemy soldiers (Mangala), the young ideologue (energetic Mangala rules 9-ideology) Ms. Fonda expected that her USA audience "would understand" (Guru understanding) her message. Instead, her actions were interpreted as an insult and a betrayal (6) of her patriotic allegiance. The grievance of the patriotic national settlers = 6th-from-Chandra . The nichha Guru-drishti and Shani-drishti into Kanya-2 speech = greatly enhanced by their parivartamsha = has perpetuated (Shani) the apparently indelible negative imagery of her supposed betrayal (Kanya) of homeland (Chandra). Guru-6-nichha parivartamsha Shani-8. Rahu in bhava-4 * in swabhava of Comforting Chandra, the Shadowy Specter seeks privilege via glamorous or unusual cultural roots; seeks amplified ownership of properties, unusual lands and vehicles, buildings, farms, vehicles; desires a special, important role in land use entitlements. Exciting, opportunistic, ambitious parents, especially the mother-figure. Ambitious, Over-reaching, ambitious character of the property-owners, real-estate deeds and claims, fence-makers, boundary-defenders, transporters, drivers of trucks and ships, police, schoolteachers, farmers, fisherfolk. Boasts deep roots in the local environment. Craves a showcase home, fabulous garden, or prestige lands..
Zukra-yuti-Rahu -4 occupies the security-seeking 4th-from-Chandra. Tends to produce passionately luxurious dwellings, vehicles, farms, gardens, pastures, and schooling environments.